Things have been a bit quiet in my shop lately. I have a couple projects down there that are itching to get finished, but for one reason or another, time in the shop just seems to come up less frequently than I would like. As a way to continue to record my thoughts for posterity, I thought I might take some time occasionally to dip my hand into my tool chest and share with you whatever comes out. I think I'll dub this series: Fingers In the Till. A rather fetching photo of my LV LA Jack in action. First up is my beloved Lee Valley Low Angle Jack plane. I've written about jack planes before, and I think now that I have been using this plane differently since then, I can say a bit more about it. Used to bevel this large panel. In my original treatise on my take of what a Beginner's Tool Kit should look like, I stated that one can do woodworking with just a few tools. One of them should be a jack plane. To put my money where my mouth is, I built a few projects using only those tools. Something unexpected happened when I moved to exclusively using this plane: I really got to like it. Rough work across the grain. 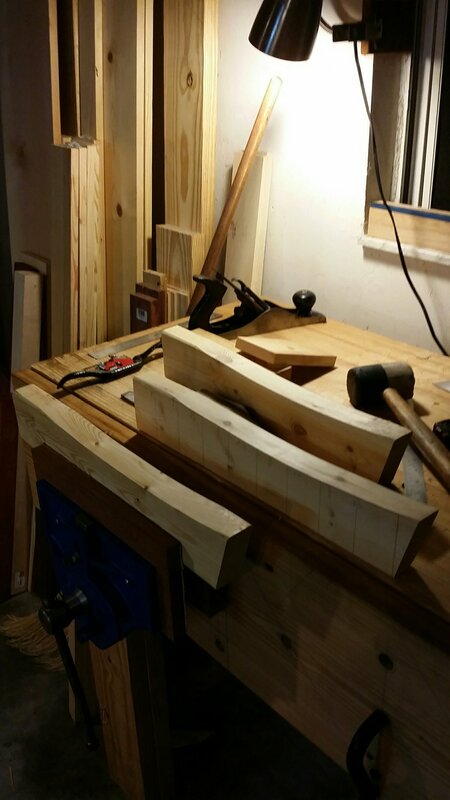 In this case, flattening my workbench. I think that using one plane, to the point where you know every single little quirk about it and can use that knowledge to the tool's best advantage is far more useful than having a choice between 50 specialty planes to do specific tasks. Up until the time I wrote that beggining tool kit post, I would typically use a scrub, a jointer and a smoother for those respective jobs, and 99% of my work with this plane was relegated to use on a shooting board. This plane excels on a shooting board, but that's not all it can do. Intelectually, I knew this plane could do all this other stuff, but figured that if I had a dedicated smoothing plane and a dedicated jointer plane, those should work better for those tasks. Right? Thickness planing with the jack. Well, the truth of the matter is for most furniture sized work, the jack plane works just fine for those tasks. In fact, it can be easier. Not only do I only have one plane to maintain and sharpen vs. three, this one plane can stay on my benchtop within easy reach to do whatever task is next. Dimensioning a piece of cherry. I feel like this plane is now an extension of my arm. I know how this plane will work and what to do to it for any particular job. I have never experienced that before. Continually switching between different planes prevented me from really getting the most from those planes. Using this one exclusively (mostly) not only helped me get the most out of this plane, but made me a better planer in general. In short, I thought using only one plane would be do-able, but instead I found out using only one plane increased my skill exponentially. This was a far bigger gift than only having to buy one plane. It only took minutes to get this nasty piece of pear looking silky smooth using only one plane. If it sounds like I am going crazy over the experience of getting good with one plane rather than specifically this Lee Valley plane, well, that's true. I know that Jonas thinks the same about a wooden smoother he has. He switches out his smoothing blade to a radiused blade when he needs to take thick shavings. 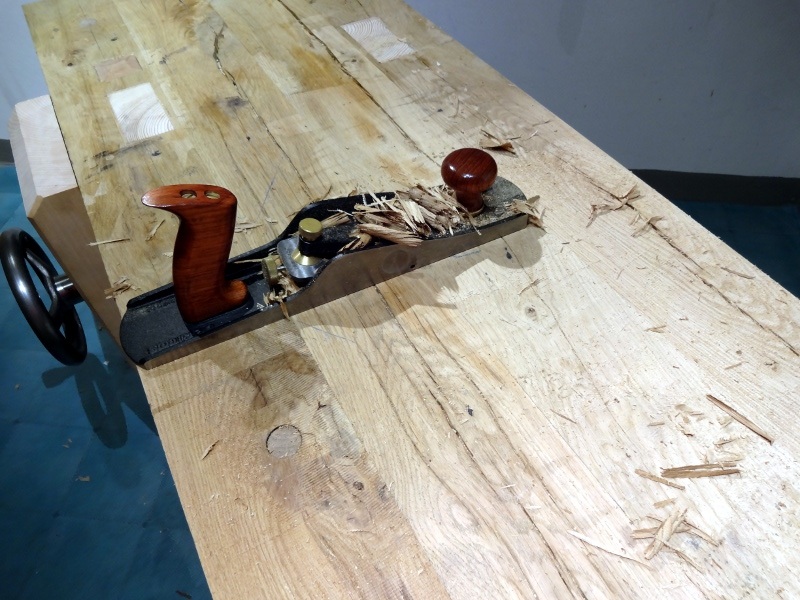 Paul Sellers recommends a vintage Stanley smoother is really the only bench plane one needs. Christopher Schwarz has only a jack plane on his list of essential tools in the Anarchist's Tool Chest (incidentally, this book is what set me on the path to what I currently keep in my tool chest). Sometimes I clamp it upside down in the vice when working small parts. This plane is of the bevel up variety, similar to a standard block plane. This means there is no chipbreaker, and the cutting angle includes whatever angle the blade happens to be sharpened at. This can be a powerful feature to use to your advantage! What I really like about this plane is it's versatility. I find myself twisting the front knob to adjust the mouth all the time. I always set up the plane by adjusting it for a fine shaving, ensuring the shaving is the same thickness all the way across. Then, I will turn the adjuster knob to make a more agressive cut, depending on the task at hand. I like to take the most agressive cut appropriate for the task. Smoothing a cribbage board. I love this shaving! Generally, the deeper the cut, the more I open the mouth. I think the mechanism to adjust the mouth on this Lee Valley plane is better than anything else out there. Even better than the Lee Valley jointer! Chamfering with the aid of my Moxon vice. I like the fact that you can change blades out for what you are doing. I have the standard 25 degree blade, a 38 degree blade, a 50 degree blade, and the toothing blade. I bought them all before I really started using this plane. In my experience 99% of usage with this plane works with the standard blade. If it doesn't, try sharpening it before you go crazy with other blades. But, when you need it, those steeper angles really do the trick. I've only "needed" to use the 50 degree blade once. I think in the old days I would have bevelled this board with a block plane. This plane is also built like a tank. I am embarassed to say that it has fallen from my bench twice (that I can remember, anyway), no worse for wear. However, I wouldn't recommend trying that out just to see if it works. 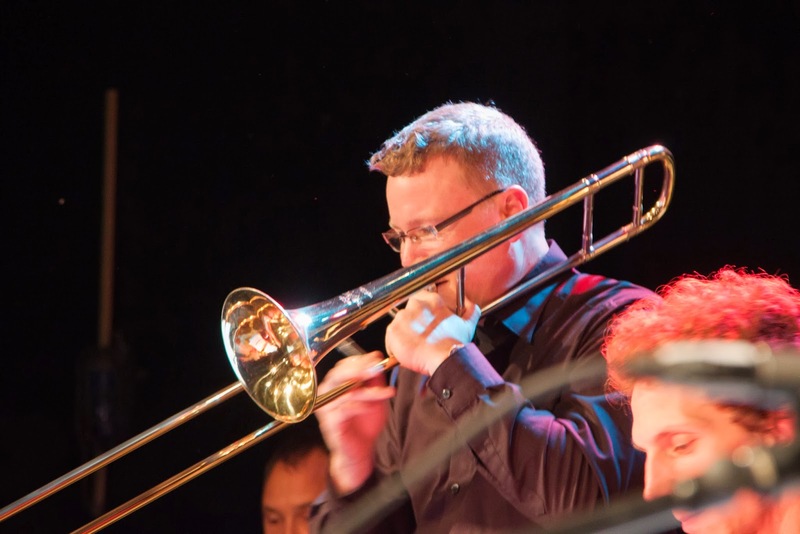 Here's a photo of my friend John playing trombone. He sometimes reads this blog, and I'm sure he'll be amused to see his picture completely out of context here. A famous woodworker said in a class I attended that this is the finest plane Lee Valley makes. I don't know about that, but it's the finest one I have. More little parts. If you try this, watch your fingers! I have clamped the handle in the bench vise. When I first bought this plane, I wanted it for use with a shooting board. I also didn't know if I wanted this one, or the one made by Lie Nielsen. I chose this one based solely on that it was cheaper in price. If I were to do it over again, I might choose the Lie Nielsen plane because the fit and finish on the Lie Nielsen is a bit finer, and it might be a bit easier to push since the blade is somewhat narrower. I think that the two plane manufacturers both came out with an excellent tool, and it is not worth it for me to make that small of an upgrade (and learn another tool). Here I am smoothing the grooves made with the toothed iron in the same plane. 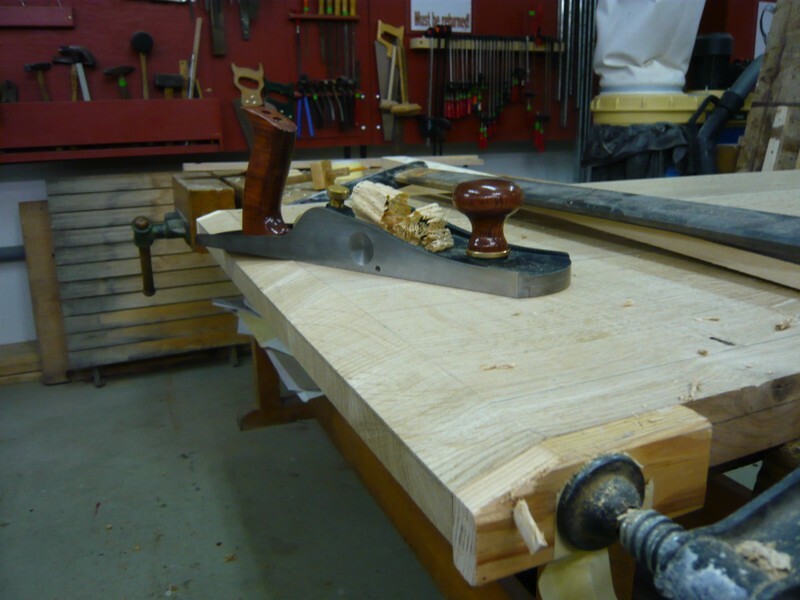 I suppose the moral of this extremely long blog post is that if you are an experienced hand tool woodworker, and don't yet have an LA jack, you probably don't need to go out and buy one. Instead, try narrowing your working arsenal of planes down to just the minimal amount. If you are new to woodworking and looking to buy a plane to fill a hole in your tool chest, this is a fine choice that comes with my highest recommendation. Do you have experience with this plane? Do you have a favorite plane? I would love to hear about it in the comments. Joy of joy, I got some real time in the shop yesterday and today. With the holidays, work, and the general lack of motion in my shop, it has been a real challenge getting to a couple of old projects. Basically the chair is done except for finish. Here is a view from above that shows what I was trying to do with the arms. So far, the chair has exceeded all of my expectations. 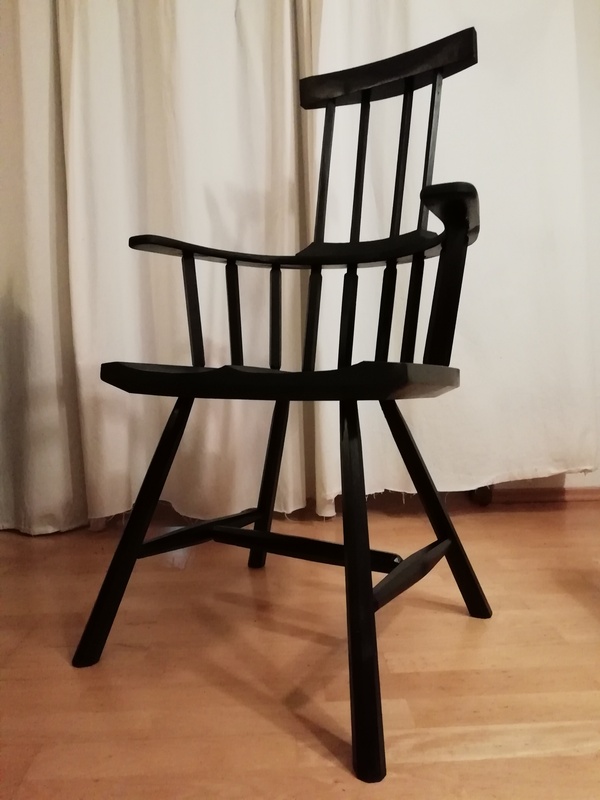 I think it is really cool, and was a good first Windsor style chair. My main problems with this build (really, I wouldn't bring it up but this bit is important to explain why I need a bit of advice) started when I tried to fit the arm rail on the sticks that I had attached to the seat. That particular part of the glue up was very stressful. This was what happened when I first glued the arm rail on. I wound up getting it to look decent enough by squirting some hide glue in there and clamping it up overnight. However, at this point I was just glad to have the arm rail on, and didn't stress too much that it didn't go all the way down to where it was originally supposed to go. It now is an inch or two higher than my original intent. I think this really doesn't make any difference, as it is relatively straight and looks good where it is. I did have to get creative planing the lamination flat after this glue up so I could glue the crest on, but it worked out. The problem is that since it is higher than I wanted, there are two sticks that don't quite stick out high enough that I could cut them off flush with the arm rail. Part of this stick isn't out far enough. Indeed, there are parts of them that sit below the level of the arm and look unsightly. #2. Yeah, it looks like #2. There are a couple different ways I could deal with this. However, I am not sure I like any of my ideas yet. I have a couple days before I can work on this chair again, so I would love to year what you would do to fix this if it was your build. Please leave a comment, I'd love to hear from you. The chair is amazingly comfortable. BTW, I am a bit slow on reading up on some of the blogs. I just read this one today, and was pleased to see my chair mentioned in this contest! Thanks to MWA for putting on this contest. I've mentioned it before; sometimes one just needs to finish something quick and easy to get some momentum going in the shop. This project hardly is fine furniture building, but it does yield an opportunity to practice some basic skills. My wife has always had these clunky coat hangers that were probably in fashion 20 years ago. They are made from scots pine (Pinus sylvestrus), and every once in a while the screw-in hook on this style comes out and needs to be glued back in. I had one in my shop, thinking that it might be a nice exercise to do some kind of double sliding dovetail patch. Needless to say, this hasn't ever gotten done because there always is something more important than that to spend a few hours fiddling with this patch. Today I decided just to make a new one. I am not talented with a bowsaw, so even with all the clean up involved there, this took about 30 minutes from marking out to applying finish. The top one is the original, the bottom is my copy. This is the perfect piece to do with a scrap piece of paulownia (Paulownia tomentosa). It is so easy to saw this stuff. I just traced the pattern from the original onto my roughstock, sawed it out with my bowsaw, and cleaned it up with some spokeshaves, rasps, and a little bit of 180 grit sandpaper. I finished it with some leftover tung oil I had mixed up with turpentine on a previous project. I know that you can buy these screw-in hangers from some woodworking supply places, and can recommend them for a quick and dirty project. Time will tell if this wood holds up any better than the pine did. I think my next hangers will be copies of these hangers I found in a Bavarian open air museum. I think these would be a fantastic short exercise, too! I really like the bottom two. Those are next. Getting back to work on an old project. More about this one next time!